Lincoln Hall, Chicago, IL, 11/14/2017. Chastity at Lincoln Hall, Chicago, IL, 11/14/2017. Pile at Lincoln Hall, Chicago, IL, 11/14/2017. JEFF the Brotherhood at Lincoln Hall, Chicago, IL, 11/14/2017. Nashville-based brothers Jake and Jamin Orrall emerged from a meditative, psychedelic haze last November with their latest LP, Zone. A scuzzy exploration of hooks and feedback, the album harkened back to the anthemic joy that marked the group circa 2009’s Heavy Days. It also makes for one hell of a live show. 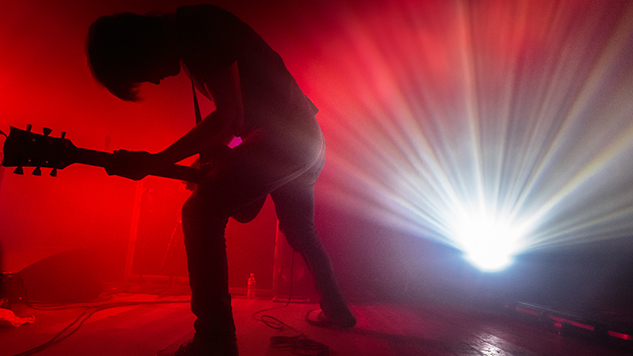 Paste photographer Sarah Hess captured the group during its neon-drenched Chicago stop for TNK Fest alongside openers Chastity and Pile at Lincoln Hall. Check out live shots from all three groups including portraits featuring the titular brothers.